Quitting smoking has become a target for thousands of people who want to get rid of tobacco once and for all. For health, for aesthetics, for the economy… every person has more than one reason to escape from the devil of cigarettes, which one is yours? Abandoning tobacco addiction is a long and difficult process in which it is essential to have the total and absolute conviction of your goal. If you have reached this article it will probably be because you have already passed that phase of doubt and you have clarified it, or not? On the other hand, if you have a tendency to suffer from anxiety or nerves, it is likely that you have found a way to calm them in tobacco. But it is very important that you know that it is better to stop as soon as possible. Over time it can affect you much more than you think, especially in your health. The bad news is that the substances carried by cigarettes are very exciting. This makes it seem like a complicated mission, though not impossible. Furthermore, it is important to keep in mind that it is easy to fall back especially in the first few months. These are just some of the best known, but the truth is that most ex-smokers confess to having done it thanks to the most effective way: Willpower. But there is also good news! Live at a time when technology accompanies you and helps you every day. When we talk about technology, we are talking, of course, of smartphones in which it is possible to download applications to quit smoking best suited to one’s needs and uses. You can even combine several to optimize all your efforts. If you start the process to quit smoking with your cell phone, you don’t do it alone, but you know that there is someone watching over you. Like Big Brother, but from your mobile. Below, we present some examples of these smoking cessation apps that propose to guide you in a personalized and gradual way towards a better quality of life. Do you also want to use your smartphone or tablet to say goodbye to cigarettes? QuitNow! is the most complete app on the market to help you quit smoking. Very easy to use and also available in the paid version with some more features. It will be enough to set your own data (the date you stopped, number of cigarettes smoked every day, cost, etc …) and immediately you will have available some very interesting statistics about the days without cigarettes and the money saved. 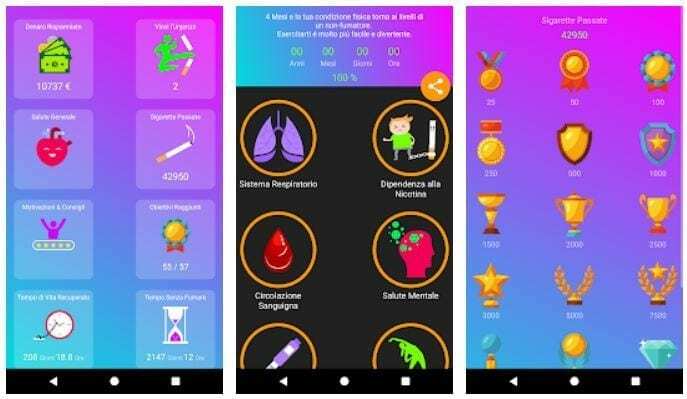 In the Health section it is possible to keep one’s health under control (such as the decrease in nicotine on the body or carbon monoxide), while in the Objectives area it will be possible to celebrate and share via email, SMS or social networks the goals achieved. There is also a Gallery area with photos and disturbing messages also used in cigarette packs, and a very interesting Community area, where it will be possible to register and interact with other users who like you want to quit smoking. It is, without doubt, the most complete free app we’ve found. With such a simple and direct name, the function of this application is clear. EasyQuit is a free quit smoking application that uses mini-games, statistics and various options designed to alleviate things like the desire to take a cigarette. Do you feel like smoking? Play the memory game with friendly icons to overcome the scientifically proven 3-minute mark and overcome your urgency. Can’t you stop smoking right now? No matter, Easy Quit has a “slow mode” to help you stop smoking slowly, it will create a personalized plan to get rid of the cigarette without pain or stress. 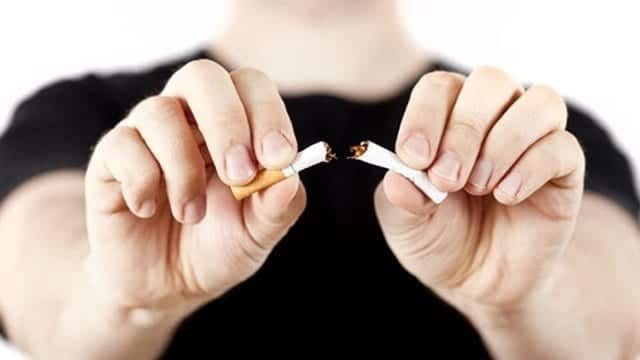 You can connect up to 5 reminders to monitor and get rid of nicotine and smoking addiction. Based on scientific studies and the unbeatable feedback of millions of ex-smokers, this app will motivate you with elements like winning up to 48 different dishes from the first hour you quit smoking up to two years, including the electronic cigarette recognition plates. It also allows you to see day by day how your health improves in all aspects such as blood circulation, mental health, oxygen levels, taste and smell, nicotine addiction and decreases the risk of developing diseases heart disease and cancer. And last but not least, it will show you how much money you saved by not smoking. There, right in the pocket, a motivation of weight without a doubt. This application is very different from the previous ones because it tries to motivate you to stop smoking by showing the worst of tobacco, so it can serve as a compliment for the first few days. Smoking Time Machine asks you to upload a photo of your face and indicate your age, so it will show you how tobacco will affect your skin and your appearance in general over the years. Very effective to make you aware of what will happen to your health if this habit is not eliminated. It is a great help to increase awareness of the harmful effects of tobacco. If you wanna stop smoking, start vaping. I stopped smoking completely and permanently within a month when I started vaping. So did thousands of other South Africans and hundreds of thousands more across the world. An app can’t help you stop smoking, and patches and drops and pills and whatever else doesn’t work. I’ve tried them all.